Psychology - Schizophrenia Full Notes AQA Psychology Schizophrenia - A2 Essay-plan style notes for the full syllabus of A2 Schizophrenia. Detailed enough to allow for a 16 marker per topic. Hand-written but easily legible. Helped me get an A* in mocks. Clearly laid out and easy to follow. Psychology - Biopsychology Full Notes AQA Psychology Biopsychology - AS and A2 Essay-plan style notes for the full syllabus of AS and A2 Biopsychology. Detailed enough to allow for a 16 marker per topic. Hand-written but easily legible. Helped me get an A* in mocks. Clearly laid out and easy to follow. Diagrams included where necessary. Psychology - Social Influence Full Notes AQA Psychology Social Influence - AS Essay-plan style notes for the full syllabus of AS Social Influence. Detailed enough to allow for a 16 marker per topic. Hand-written but easily legible. Helped me get an A* in mocks. Clearly laid out and easy to follow. Psychology - Attachment Full Notes AQA Psychology Attachment - AS Essay-plan style notes for the full syllabus of AS Attachment. Detailed enough to allow for a 16 marker per topic. Hand-written but easily legible. Helped me get an A* in mocks. Clearly laid out and easy to follow. Social Influence booklet - all content In depth booklet on the whole content of social influence including the specification requirements and evaluation. All in note form which allows for easier revision and better memory. Visually easier to read and understand the content. Psychology - Forensics Full Notes AQA Psychology Forensics - A2 Essay-plan style notes for the full syllabus of A2 Forensics. Detailed enough to allow for a 16 marker per topic. Hand-written but easily legible. Helped me get an A* in mocks. Clearly laid out and easy to follow. Memory- Psychology AQA Providing a complete summary for the memory topic in AQA Psychology. Includes all key topics and studies. A* Research Methods Revision - AQA (7181-7182) Psychology Complete breakdown of the Research Methods section of the AQA (7181-7182) Psychology specification. Everything you need for the large section in the paper 2 exam - covering both AS and A2 content. Includes a breakdown of all the stats tests and all definitions and evaluation points. Behaviourist approach 16 mark essay (AQA 7181-7182 - Psychology) Example essay for approaches - 15/16 mark given. Psychology - AQA 7181-7182. Attachment: Influence on later development 16-mark essay My own essay written for the Influence of attachment on later development section of the Attachment topic - received a 16/16 mark. Biological approach 16 mark essay (AQA 7181-7182 - Psychology) Example essay for approaches - 15/16 mark given. Psychology - AQA 7181-7182. Attachment: Maternal Deprivation 16-mark essay My own essay written for the maternal deprivation section of the Attachment topic - received a 16/16 mark. A* Attachment Revision (AQA ALevel Psychology 7181-7182) Complete breakdown of the Attachment section of the paper 1 exam (AQA A-Level Psychology 7181-7182) - everything needed to ace the exam. 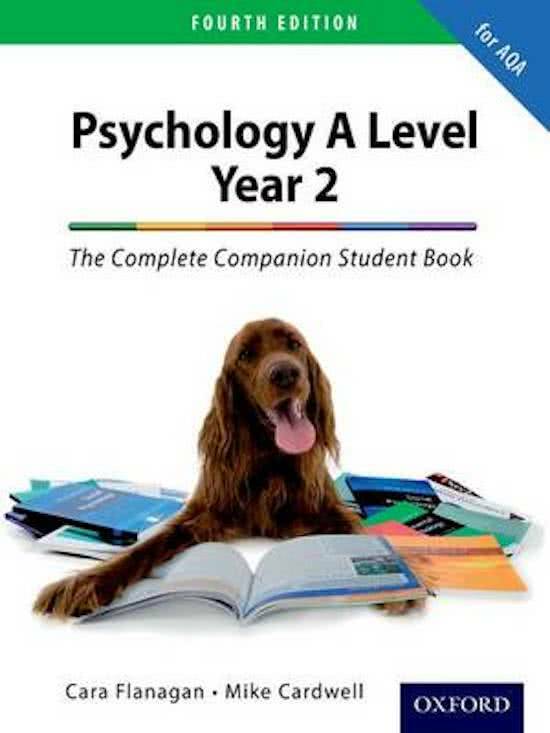 On this page you find summaries, notes, study guides and many more for the study book The Complete Companion for AQA Psychology A Level, written by Mark Cardwell & Cara Flanagan. The summaries are written by students themselves, which gives you the best possible insight into what is important to study about this book. Subjects like Psychology, AQA, AQA Psychology, A Level, Attachment, typed, AS Attachment & Approaches will be dealt with.